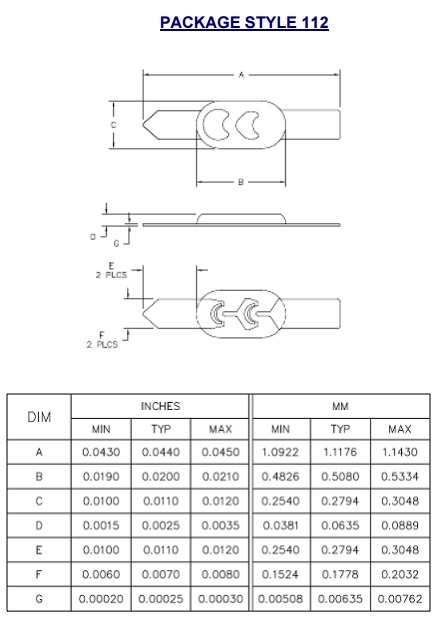 Semiconductor mesa bean lead PIN diodes are designed for very low inductance, low resistance and moderately low capacitance with ultra-fast switching characteristics. The structural details include thermal oxide junction passivation thus providing reliable operation with stable junction parameters along with ceramic glass, which provides mechanical strength to the diode. These devices are designed with a narrow base width, a high intrinsic ‘I’ layer that provides low loss, high isolation and ultra-high speed switching characteristics. This series of diodes meets RoHS requirements per EU Directive 2002/95/EC. The Standard terminal finish is gold unless otherwise specified. Consult the factory if you have special requirements.